Drawing on the newest historical research and scholarship in the field, Modern South Asia provides challenging insights into the history of this fascinating region over the past three centuries. Jointly authored by two leading Indian and Pakistani historians, it offers a rare depth of historical understanding of the politics, cultures, and economies that have shaped the lives of more than a fifth of humanity. In this comprehensive study, the authors interpret and debate key developments in modern South Asian history and historical writing, covering the diverse spectrum of the region’s social, economic and political past. This fourth edition brings the debate up to the present day, discussing recent events and exploring new themes such as the capture of state power in India by the forces of religious majoritarianism, economic development in the context of the 'rise' of Asia, and strategic shifts occasioned by the US withdrawal from Afghanistan. 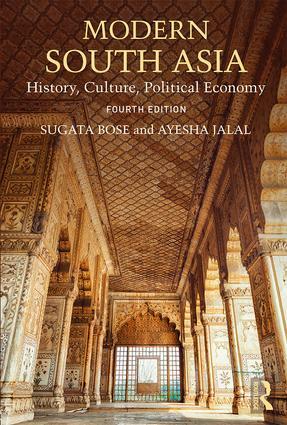 Providing new insights into the structure and ideology of the British raj, the meaning of subaltern resistance, the refashioning of social relations along the lines of caste, class, community and gender, the different strands of anti-colonial nationalism and the dynamics of decolonization, this is an essential resource for all students of the modern history of South Asia.